Powers: OverLord’s armor makes him invulnerable to harm, providing him with a powerful force-field which can deflect most any attack. The actual armor is made up of dense metal that is almost impossible to breach and can withstand Dragon’s punches with no problem, giving an indication of its durability. The armor also projects intense energy beams and allows its user to fly for an unknown length of time. 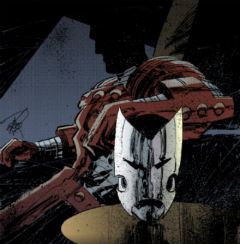 Following CyberFace’s death aboard Vanguard’s spaceship, the OverLord armor was left in the vessel to prevent it falling into the wrong hands. When the spaceship was temporarily disassembled, the armor was left drifting in space. It eventually fell back down to Earth where it was recovered by officers of the Chicago Police Department. The armor was to be a surprise gift to Dragon during the party held to celebrate his return to the force. Unfortunately, Octopus and OpenFace activated it via remote control and had it fire off its deadly photon blast, annihilating the precinct and killing almost everyone inside. They then had the armor fly to them where they set about making the device their puppet as they seized control of the Vicious Circle. Dataman was brought in to add his expertise to their own but he betrayed his colleagues by aiding an unseen man take possession of the armor. This new OverLord killed Dataman to preserve his secret identity before destroying all of the equipment that had been used to control the armor. The new OverLord immediately set about claiming power by murdering the reigning leader of the Vicious Circle, Buster Justice. He then renamed the organization simply “The Circle” and re-dedicated them away from crime and towards procuring freak rights. Captain Jack Stewart became a surprise ally to OverLord and when Dragon reverted back to his original Emperor Kurr persona, they worked together to try and bring him down in several failed attempts. Due to a combination of a desire to move away from criminal enterprises and the large number of their colleagues dying under his command, the Vicious Circle rebelled against OverLord’s rule and rejected him as their leader. With his minions having abandoned him, OverLord found himself alone in his quest to change the public’s perception of super-freaks and sought out advice from Captain Stewart. He was fearful of waging open warfare against the Vicious Circle for fear of killing his former allies and causing other death and destruction but Stewart pointed out that such carnage was now inevitable. If OverLord was to truly achieve his goals, he would need to become a role model to super-freaks everywhere and this causes OverLord to take up a role as one of Chicago’s heroes. He later prevents a bank robbery by two VC members FirePower and Crippler. While he easily defeats FirePower, Crippler takes a hostage. OverLord swiftly takes care of him by shooting a blast which causes Crippler’s head to explode. OverLord later trys to recruit Malcolm to his cause which leads to disastrous results. OverLord is sucker punched by Malcolm and a battle ensues near Malcolm’s neighborhood. The battle shows no indication of ending until Adrian “Spoons” Weatherspoon verbally attacks the pair. Feeling foolish, OverLord leaves the scene. During the Tyrrus Combine attack on earth, OverLord decides that enough is enough and once again chooses to regain control of the VC by force. He crashes into one of the Vicous Circles bases while Brutalizer is beating up other VC members. OverLord tells Brutalizer that the VC needs to get together and help fight off The Tyrrus Combine, otherwise all hope will be lost. When Brutalizer refuses, OverLord kills him. OverLord then leads a charge of VC members aganist the alien threat with horrible results. Numerous members of the VC are slaughtered while OverLord is able to hold his own. After the invasion is ended thanks to the intervention of All-God, OverLord is able to witness firsthand the massacre at his feet. He is hit in the head with a rock by Hell Eyes who claims that all the members of the VC who died only did so because of him. OverLord decides to spare Hell Eyes and leaves the scene. Later the tabloid magazine Gossip Rag headlines that OverLord is out to destroy the Vicious Circle. This causes VC members to fear for their lives which then leads to a group meeting where the majority of the VC decide they want OverLord dead. Powerhouse stands up for OverLord, to no avail. OverLord then attacks Willard, the Gossip Rag writer, but is interrupted by Malcolm. A battle insues with OverLord blasting Malcolm and leaving him near deaths door. Angel Dragon then attacks OverLord, who soon leaves the scene of violence. Angel then vows that OverLord must die. In order to help Angel out, Daredevil enlists the aid of the Little Wise Guys in locating OverLord. Once OverLord is located, Daredevil tries to capture him, and is soon joined by Angel and Malcolm. While things are not looking great for the trio, a surprise ally joins the fray who is none other than Dragon. Dragon quickly deals with OverLord, badly damaging the armor and knocking OverLord’s mask clean off. It turns out that the person under the mask was none other than Flash Mercury and was hiding his mask in the special compartment of the armor. He is then arrested and carried off by the police.